Ha ha! I can see my husband laughing at me now if i did that. Apart from the things that you mentioned we love to eat shepherd’s pie from leftover mashed potatoes. I would also probably try to make some make ahead mashed potatoes and freeze them. Of course, hasbrowns for breakfast and potato soup would be on future menus! I would like to thank you for introducing me to Azure. I learned of them from your blog a few years ago and contacted them. They didn’t have a drop site in our area at them time but told me that they would contact me if they ever did. I was so disappointed. We’ll I got the call I’d dreamed about last March telling me that Azure was looking to come to my area and they wanted ME to be the drop manager. I took the opportunity and haven’t looked back. Thanks again for the great blog! My community is loving AZURE…and I am so thankful to have the privilege to serve as drop manager and to buy great products from a great company! Awesome – I love how they keep expanding! That’s exactly like my story, Brandy! Our drop started last January so we’ve been ordering for just over a year now, and I, also, am the drop manager :) We are so grateful for their great products and great customer service! Thanks Heavenly Homemakers!!! same here! I live in Memphis TN and I read about them on a blog about 5 years ago. and now they come out here and I created a very successful drop point. I LOVE azure. I spend a pretty penny with them each month. I made a really yummy loaded baked potato soup yesterday. You can slice them up with a food processor and them dehydrate them. At least you have many options to use them…Good Luck! If you can keep the potatoes in a cool dry place they will keep for months! O I can’t wait until tomorrow we are having twice baked taco potatoes. OH, and I think I have heard (Alton Brown, maybe?) if you bury them in dirt and store in a cool place they keep a LONG time and do not grow eyes! I love Azure! I just ordered and received 50lbs of organic russets and wasn’t sure what I was going to do with that many since I don’t normally keep that much on hand, I can’t imagine 100 lbs! I think all of your ideas are right on and since the weather is still cool they should keep pretty well. Azure delivers to two different cities within 30 miles of me and I have numerous friends from church who order from them then share what they oredered with each other. They have asked me if I want to join them but so far I haven’t maybe in the future I’ll give them a try. Idea for how to use all those potatoes – how about Homemade Potato Chips. Baked of course. We have the privilege in our area of getting a weekly Azure Standard delivery instead of monthly. It’s really nice! There is also a new food co-op in our area called Bountiful Baskets. They have a standard basket with 50% veggies, 50% fruit and then you can also order different add-ons like breads and things like that. I just found out about them and will be picking up my first basket this Saturday. I’m excited to see how it turns out! I ordered potatoes to Alaska from Azure today. Only ten pounds though. ;) I love getting Azure too. Such a blessing. They are improving their system to to only allow orders of things currently in stock, but I played honey roulette all last year afraid to order more than one type of honey and end up with several gallons but getting none each month! I made my first azure order! Here in Arkansas we have awesome farmers market and local produce, we have our own chickens, goats, and other animals. We also have an awesome health food store! But i was AMAZED at prices from Azure. I prefer spectrum palm shortening and was able to get it nearly 3 dollars cheaper per container! Also got i got 20 lbs of apples way cheaper that way. Peas, thought i was buying sucanat but it was actually evaporated cane sugar not sure bout it? Wheat, kamut, spelt, flour( didn’t come in) then peas, oats, dried onions, garlic powder, onion powder, aluminum free baking powder, was AMAZED at the reasonable prices. I will continue ordering from them! Sucanat is a registered trademark and essentially the same thing as evaporated cane juice. I just received some in my order this month too. I meant evaporated cane sugar (which is still all the same, I think). Actually, I made the mistake of ordering evaporated cane juice once, and it was different from sucanat. Sucanat is DEHYDRATED cane juice, and there is a little difference. I actually order both Sucanat and Evaporated Cane Sugar. They are different. Sucanat is darker brow, and less refined than Evaporated Cane Sugar. I prefer Sucanat for my coffee and baking, but the Evaporated Cane Sugar works better for making Kombucha. Laura, I clicked on the imaginary like button after reading this post! :) Blessings to you today! HA! After reading your reply…I actually did look for a “LIKE” button….LOL…i need a facebook break! HA! Just “LIKED” it….LOL…thanks Laura! Yea! My kids (and me, who am I kidding?) love to get our Azure orders and unpack them! I am the drop point manager for our area and it is SO nice that it is so easy and efficient. Ooh, so good to know! Thanks! I didn’t know and I received no potatoes this month. So hoping they come to Wisconsin soon! They do now have midwest routes and go to the states around us but not WI. I have sent emails hope there are enough requests. The food all looks so good. I’m hoping they come to WI soon too! I called them up when Laura mentioned that they may be expanding their route to WI in April. Hope enough other people want it here as well. They called me last week about getting a route here in WI….haven’t had a chance to call them back yet…where do you ladies live? Maybe we are close enough to get a route together…I am in Waukesha! I live in western Racine county about 5 minutes from Waukesha county.Maybe we can get a route together! We are in the Madison area and would love a drop anywhere in southern WI, east or west.I’d be willing to drive up to 90 min to do a pick up. I’ve moved further from you (now near Beloit) but would possibly be wanting to jump on if a drop was put together somewhere in SE/South Central WI. Keep me in mind if you find anything developing! My e-amail is fuerniss at hotmail. Thanks! I must confess to being a wee bit jealous of you. I’ve heard of Azure Standard before, but we live in MD and aren’t on their delivery route. I am hoping Azure will expand into Mississippi, but they haven’t so far. I would love a gift of potatoes! I give folks eggs from our chickens! Our pastors wife loves the fresh eggs and frequently on Sunday mornings ~ we will leave a dozen on his office desk! I just learned about a drop about 45 min away. Do you mind telling what cheese you buy from them? I, too, found Azure through you and am so glad I did. When we first moved to DFW, I had a very hard time finding organic foods other than at Whole Foods and their prices are outrageous! Azure began a route here shortly after and I’ve been a loyal buyer since. 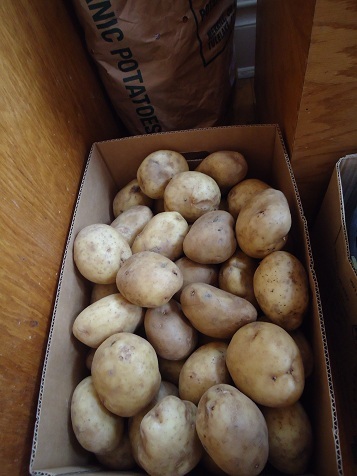 Last fall we got 50# of potatoes and stored them in a large cooler in the garage. Last month we finished them up! I usually order apples during the fall/winter, as well as all grains, dried beans, cheese, and so much more. Thank you! If you have the time to can some of the potatoes, they are so handy for quick stews etc. or open a jar and add frozen peas and add some white sauce for creamed potatoes and peas with a little onion added. Yummmmmmmmmmmmm. I have canned potatoes, carrots and celery together for quick stews. Very handy and less cooking time. Love seeing what you pick up! Until Azure comes to WI I’m trying to get as much as I can online and am off to try Trader Joes. They are about 45 minutes from us,but if they have good prices it will be worth a drive once a month or so or whenever we happen to be in the area. Also found a coop about an hour’s drive from me along with a place that sells honey reasonably and a Christian farm that has a farmstand selling organic produce so that could be a monthly trip option as well. We’ll see. I think this shopping will be simpler and more fun than my previous double couponing shopping,but first have to figure out all my sources and that is time consuming right now. Gina – where are you getting your honey, and where is the Christian farm? I am also from WI and have been on the lookout for such items. Thanks! Well I don’t know where you are located,but the places I found are in Janesville area. The name of the farm is Amazing Grace farm and the honey is from Orlovsky Apiaries. Basics Cooperative is the coop in Janesville. Hope this helps! I am having a hard time finding stuff real close as well,but hopefully this will work for now. Oh and found another farm called Highcross Farm that is another Christian farm in Campbellsport which is a bit of a drive for us. They do CSA’s and deliver in deifferent areas,but are too pricey for us right now although it does seem they are willing to work with you. We just moved to Turtle (between Clinton and Beloit) so would LOVE any info on real food farms/co-ops and such that you can share. My resources are Milwaukee area and north and I’m just starting to search in this part of the state. My email is fuerniss at hotmail if you would be so kind! Thanks for any info you can pass on! We have a great honey farmer near Madison, wi, called Gentle Breeze Honey. They attend the same church as us and are amazing with their bees, doing prairie restoration and selling responsibly harvested raw honey. Seems that a lot of us are from WI and can’t wait until they come, they do have a midwest Azure facebook page. We are able to order from Azure Standard, also, and I just started ordering white wheat instead of just red for making rolls and pancakes–yum, and thanks for the suggestion! 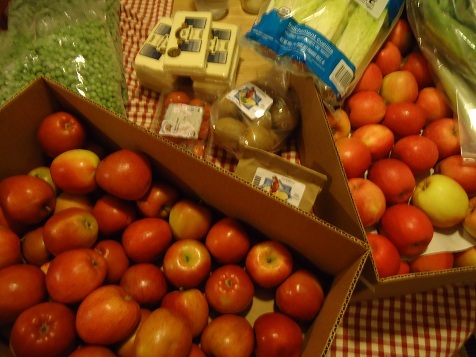 We also ordered a 20 lb box of apples this month, and they are oh-so-good! I’ve never ordered, but I have always wanted to! Truth be told, I’m intimidated by the bulk ordering. I have a small family (3 members) and we eat small portions, and we have somewhat limited storage in our townhouse. We do have whole foods stores, but they come with hefty price tags. Any thoughts? Should I go for it anyway? I also order for Azure and I got 50lbs of potatoes last month! We have been eating a lot but not using them enough. I followed your link to your hashbrown recipe and I cannot wait to try that and have some potatoes in the freezer. Thank you for sharing!! Still looking for something in Rhode Island, Connecticut, Massachusetts – close to both Conn. and Mass. Anyone know of any co-op where I can get bulk. I am putting in order to Zaycon foods – chicken (boneless/skinless) – $1.79 lb. Don’t know of anything else. Can you order stuff from Azure and they ship it to you – or you have to be on delivery route? You can order and have them ship it directly, but my understanding is that the shipping costs often negate the savings. Here is an option for organic foods but not as many bulk items. “Nothing says “I treasure our friendship” like the gift of a bag of potatoes, right?” Made me laugh! I’d love to receive a bag of potatoes! How far do most of you drive for your orders? I’ve been wanting to order, but the closest one is a little over an hour away. is that normal? Is it worth it? I already use and love Redman pink salt. Would love to win the draw for Redman Paste. I found this very funny because I have considered doing that very same thing, only with apples. I am so grateful for Azure-best prices ever. It has really helped our grocery bill. What I appreciate the most is the great produce they offer. When I first read about Azure, they didn’t deliver to my area. I was SO EXCITED when they added a drop about 30 minutes away last January! We just got 20# of Honey Crisp apples… my husband’s favorite. Their prices on many, many items are outstanding! I used to pay $4 for a small bottle of organic mustard from the health food store. A while ago, I ordered a gallon of organic mustard from Azure for $13.00. We refill our smaller jar. A HUGE money saver! They also have great prices on gallon sizes of white wine vinegar and sesame oil, which I use to make homemade mayo. I also purchase grains and beans in bulk. With 2 little boys, I go through a lot of oxygen bleach in my laundry, and they have a good price on a 50 pound box. So much cheaper than the little bottles I used to buy. I also buy hand soap and dish washing liquid in gallon size bottles and refill my smaller containers. They have great deals on a lot of non-food items, as well. I do price compare with Trader Joe’s though, and have found several items to be cheaper there. We have one about 15 minutes away from my husband’s work, so he goes every 2 – 3 weeks. Azure has been a great addition to my regular shopping sources, which include Trader Joe’s, local health food store, local farms, and a local organic delivery service (which brings raw milk and pastured eggs to my door every week!). I’m so thankful Azure expanded to my area. I ordered an Azure catalogue after reading about them on your site. It’s big and I’m scared. They deliver here but we just haven’t made the jump yet. One day I’m sure. Keep talking them up. I did the exact same thing with apples last month! Mine hadn’t come through the month before so I over ordered but we have really enjoyed them all! I since read that we can put in the comments section when we order through Azure if we’d like to sub an item if one isn’t in stock. Will definitely be making use of this in the future! I would make all the items you mentioned…potato soup…twice baked potatoes (they freeze beautifully…and make a wonderful side dish! )…maybe try some homemade potato chips ~~ perhaps fried in coconut oil (I love how beautifully CO fries things a lovely golden color!). We live on a small farm, and have been moving toward a self-sustaining lifestyle for several years. As we move toward that goal, we are also incorporating more natural products into our daily lives. Homemade and naturally prepared health and beauty products are just as important to us as homegrown vegetables and grass-fed beef. I’d love to have the chance to try these products for free! Thank you. I think that is amazing how you ended up with lots of taters to share with those you love! No Azure Standard in Central Florida. ::cries:: I have to drive all over town to find everything I need. I’m just thankful that our warm weather allows for lots of little farms all around that I can get wonderful fresh produce from. I wish we could order from Azure Standard! looks amazing! I live in Nebraska and I can only WISH to get my men hooked on natural toothpaste. Thanks for the great giveaway! Here in Western SD we are blessed to have Azure Standard deliver every 4 weeks. We also have a buying club that gets United Natural Food deliveries every 8 weeks. Bountiful Baskets is available every week. We are also blessed to have individuals who are able to bring in trucks of different fresh fruits when in season. Both Bountiful Baskets and Azure are opening new sites all over so if you are not blessed to have a drop at this time you may want to check then out and see if you can start one. Oh, as for potatoes, I get over 300lbs each fall of Yukon golds. They are just now starting to grow eyes. The few that are left will be what we plant this spring. Yes evaporated and dehydrated not the same but different sugar brands use different thing, well i am just saving it and il probably use it up but i definitely prefer sucanat so much i ran to the health food store and got some but hopefully they want be sold out again st order i really do love Azure! Wow. 100 lbs. of potatoes?!! I thought the 3 lb. bag I had to get through was hard! lol Luckily, I raise mealworms for my chickens, so if I have any potatoes (or apples) that get too far gone for me to eat, I feed the mealworms, who feed the chickens, whose eggs I enjoy, so it all works out. I wouldn’t worry about the potatoes at all! Our family of 5 (three are very little) buys 150-200 pounds of potatoes from the farmer’s market in the fall before they close up. Then we eat on them as normal through the winter. And when they start to sprout and need to be used up I just plan a big processing day. I bake and shred some for hash browns, they go in bags in the freezer. Then I boil a huge pot of water and start cooking potatoes. When they are cooked I use a slotted spoon and pull them out into my HUGE stainless steel bowl. They are mashed with butter, milk and cream cheese, seasoned and then frozen for future meals. They reheat beautifully and are so good when all the fresh potatoes are gone and we miss them! And after batch after batch has cooked in that same water I leave the last ones in and have a super creamy potato soup as the water has so much starch from all the potatoes. To that I add lots of seasonings and such and we top with cheddar cheese, bacon, green onion and sour cream (or whatever we have of those items) and call it baked potato soup. So good! A french fry cutter is a wonderful, life changing do-dad. So is an apple peeler. Being married to an apple pie lover for 32 years has raised my appreciation for the apple peeler to almost worshipful status. And I got mine for $14 at a local home goods store with a coupon. My french fry cutter was only $15! We would have no problem handling 100 lbs. of potatoes. I usually grow at least that many every year – and after curing, they go down into the unheated part of the basement, along with apples and pears. They keep for months. Pumpkins go upstairs in the attic, as they seem to keep better where it’s drier. I love your freezer hashbrown method. I use it all the time when my potatoes start to get eyes. Well how funny is this? We didn’t get our potatoes last month either, so I have 50# coming. I almost ordered two different kinds like you, but at the last minute changed my order. Now, if my potatoes don’t come in this week, I’m flying to Nebraska and getting my share from you. I’m in CA, southern, so I can get a lot of the produce fairly inexpensive at the local store, organic of course. Well, let’s see, you can make freezer potatoes. I can’t wait, it’s so handy to open the door and see diced, hashbrowns and maybe even a potato casserole. Or french fries. All ready to toss into the oven. Or pan. I will use my food processor for making the hashbrowns, it really speeds up the process. I know this makes me a nerd, but I’m kind of jealous of all those potatoes. Have you ever used the Pampered Chef potato slicer? You simply press down on it like you would an old fashion apple corer/slicer. It makes absolutely perfect french fries and takes no time at all. My son loves it so much that he carried it on a Boy Scout camping trip this weekend as he was the chef and had homemade french fries on his menu. Forgot to add – I’m NOT a consultant for Pampered Chef so I’m not trying to sell anything. LOL. Wow, I have trouble using a 5 lb bag of potatoes before they start sprouting eyes. Still cream of potato with leek soup with a side of cheddar chive biscuits sounds delicious on a cold winter day like today. I’ve noticed people mentioning they process potatoes when they get eyes. Mine are beyond having eyes – are they not good to eat after they sprout? Can’t I just cut the emerging plant off and cook as usual? Okay, I won’t come pounding your door down. My potatoes showed up. Forgot, it was 100lbs. Although I gave 50 of it to my oldest daughter. I’ve processed two bags today, freezer hash browns. Haven’t decided what to do next. Although the 4 yr old helped me cook oven fries for dinner.